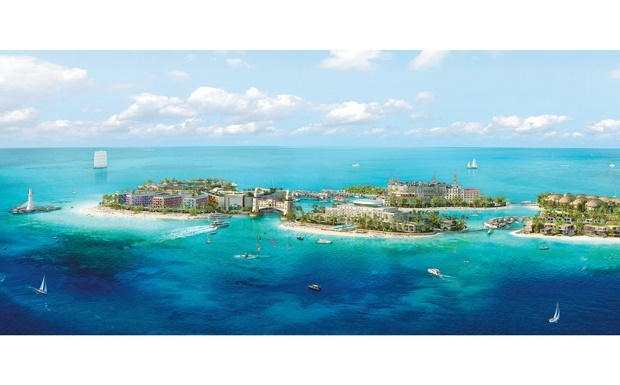 Over the years, developer Kleindienst has been beavering away on the design plans for its The Heart of Europe (THOE) development, the first major project to materialise in Dubai’s The World islands. The six-million-sq-ft master-plan development comprises six islands connected by bridges. With a combined capacity for 15,000 people, the six islands have changed names several times over the years, but the developer has finally settled with Main Europe, Germany, Monaco, Sweden, St. Petersburg and Switzerland. The project will still include a number of the features announced during its launch, such as climate-controlled streets. However, the original plan to build a mix of residential and hospitality elements has been scrapped. The islands of Sweden and Germany will house the holiday homes. Sweden will also have 21,000-sq-ft beach palaces featuring private beaches and infinity pools, seven bedrooms, sauna, gym and snow rooms. “The 10 palaces are under construction and all sold to mostly billionaires and royals at prices above Dh50m. We build them for the superrich, so they need to be special. It is [also] the first time Bentley Homes is involved with a project here,” says Kleindienst. More than 130 floating villas, dubbed the Floating Seahorse, are being built around St Petersburg island. The original and Tzar editions have been sold out, while the Signature Edition is still available. These floating homes boast 4,000 sq ft of climate-controlled space over three levels, including one under water. The floating villas also offer flexible and customised living and sleeping areas. St Petersburg will be a heart-shaped island, intending to remind honeymooners of the Maldives and the Seychelles. The five-star resort island connects to the Floating Seahorses via jetties. Despite its tropical theme, it will still evoke a European feel to “attract Europeans to come and stay here,” says Kleindienst. Located on the Europe island, the five-star Russian-themed Tzar Hotel is a remnant of the original master plan. “The entire Main Europe island was named St Petersburg originally,” explains Kleindienst. He says the island would also be home to the Italian-designed Portofino Hotel, which will be exclusive for families, while partygoers could turn to the Ibiza hotel. The island of Monaco, will offer a lifestyle rivalling the original, says Kleindienst, featuring a harbour and all the expected entertainment venues, as well as a “seven-star” hotel with panoramic sky bar. Switzerland, meanwhile, is going for a “six-star” hotel and spa. A circus will provide entertainment. “Our hotels on Monaco and Switzerland are not rated seven-star or six-star, it doesn’t exist, but tourists would consider them as such. These star [ratings] are a recognition within the tourism industry,” says Kleindienst. The first phase of THOE will be completed by year end, with the rest in stages until full completion in 2019. Among those to be completed in the first phase are some of the floating villas, palaces on Sweden, swimming pools and St Petersburg. The floating homes are being imported in pieces from different places around the world, such as Burma and Japan, and assembled in Dubai’s dry docks, before they are hauled to The World. In the meantime, all islands have been compacted and shaped, with the required infrastructure in place. The developer also built its own temporary plant producing 2,000 cubic metres of concrete a day, and a logistics camp for 3,000 workers on one of the islands. The developer has also set up a power plant for the construction of the project. Once in operation, the development would require a base load of 20 megawatts (MW) and a peak load of 50MW. “In a perfect scenario we’re building a power plant for 30MW, and the Dubai Electricity and Water Authority [Dewa] will [supply] 20MW for the base load,” says Kleindienst. “They can produce it at a better price because their price for diesel is better than ours. But I can produce the peak load for a better price than Dewa. “They’re going under the sea to connect The World, but haven’t yet started, as it’s still too early. They need more volume.